GFP ELISA Kit | Cell Biolabs, Inc. Most imaging studies of rGFP are qualitative, and GFP quantification by FACS is time-consuming and expensive. Our GFP ELISA Kit measures green fluorescent protein in a standard microplate reader. Assay is sensitive to 30 pg/mL. 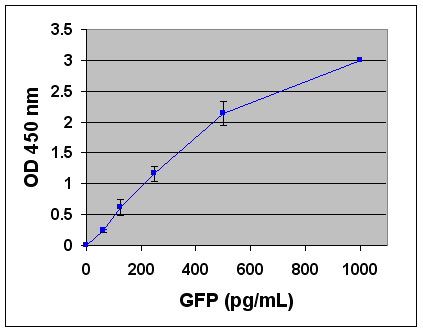 Figure 1: Standard Curve Generated with the GFP ELISA Kit. Gordon, E. D. et al. (2016). Alternative splicing of interleukin-33 and type 2 inflammation in asthma. Proc Natl Acad Sci U S A. 113:8765-8770. Yang, B. et al. (2016). Site-specific albumination as an alternative to PEGylation for the enhanced serum half-life in vivo. Biomacromolecules. doi:10.1021/acs.biomac.6b00238. Vance, M. et al. (2016). AAV gene therapy for MPS1-associated corneal blindness. Sci Rep. doi:10.1038/srep22131. Johnson, K. A. et al. (2016). The Ebola Virus matrix protein, VP40, requires phosphatidylinositol 4, 5-bisphosphate (PI (4, 5) P2) for extensive oligomerization at the plasma membrane and viral egress. Sci Rep. 6:19125. Chen, Z. et al. (2016). GADD45B mediates podocyte injury in zebrafish by activating the ROS-GADD45B-p38 pathway. Cell Death Dis. doi:10.1038/cddis.2015.300. Chen, C. C. et al. (2015). Changes in DNA methylation are associated with the development of drug resistance in cervical cancer cells. Cancer Cell Int. 15:98. Borjan, B. et al. (2015). The Aplidin analogs PM01215 and PM02781 inhibit angiogenesis in vitro and in vivo. BMC Cancer. 15:738. Gee, H. Y. et al. (2015). KANK deficiency leads to podocyte dysfunction and nephrotic syndrome. J Clin Invest. doi: 10.1172/JCI79504. Vemula, S. V. et al. (2015). HIV-1 induced Nuclear Factor IB (NF-IB) expression negatively regulates HIV-1 replication through interaction with the long terminal repeat region. Viruses. 7:543-558. Zhang, Y. et al. (2015). Characterization of the promoter of Grapevine vein clearing virus. J Gen Virol. 96:165-169. Ott, L. & Carson, S. (2014). Immunological tools: Engaging students in the use and analysis of flow cytometry and enzyme‐linked immunosorbent assay (ELISA). Biochem Mol Biol Educ. 42:382-397. Fulton, L. M. et al. (2014). Altered T-cell entry and egress in the absence of Coronin 1A attenuates murine acute graft versus host disease.Eur J Immunol. 44:1662-1671. Baez, A. et al. (2014). Production of recombinant protein by a novel oxygen-induced system in Escherichia coli. Microb Cell Fact. 13:50. Huhtala, T. et al. (2014). Biodistribution and antitumor effect of Cetuximab-targeted lentivirus. Nucl Med Biol. 41:77-83. Anyaegbu, C. C. et al. (2014). Chemotherapy enhances cross-presentation of nuclear tumor antigens. PLoS One. 9:e107894. Sendra, L. et al. (2014). Low RNA translation activit limits the efficacy of hydrodynamic gene transfer to pig liver in vivo. J Gene Med. 16:179-192. Mango, R. et al. (2014). C-C Chemokine Receptor 5 on Pulmonary Mesenchymal Cells Promotes Experimental Metastasis via the Induction of Erythroid Differentiation Regulator 1. Mol. Cancer. Res. 12:274-282. Mitchell, A. et al. (2014). Promyelocytic Leukemia Protein Is a Cell-Intrinsic Factor Inhibiting Parvovirus DNA Replication. J. Virol. 88:925-936. Coghill, J.M. et al. (2013). CC chemokine Receptor 8 Potentiates Donor Treg Survival and is Critical for the Prevention of Murine Graft-Versus-Host Disease. Blood. 122:825-836. Pedersen, J. et al. (2012). Glucose Metabolism is Altered After Loss of L Cells and α-cells but Not Influenced by Loss of K Cells. Am J Physiol Endocrinol Metab. 304:E60-E73 (#AKR-121). Zhou, W. et al. (2012).Inducible Podocyte Injury and Proteinuria in Transgenic Zebrafish. J. Am. Soc. Nephrol. 23:1039-1047(#AKR-121).